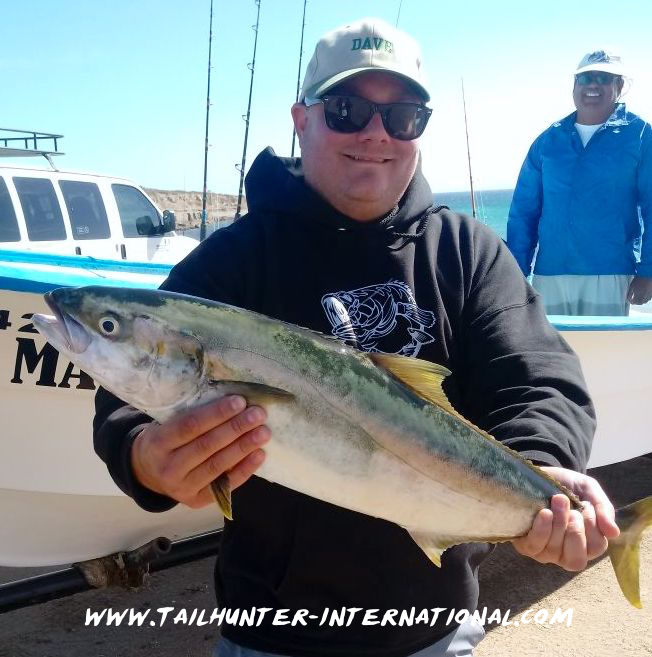 Sam Naramore came to visit us from snowy Boise, Idaho and was out with Captain Armando when he got this nice yellowtail and lost another. He also got some good action on bonito over 3 days fishing but wind hampered efforts. 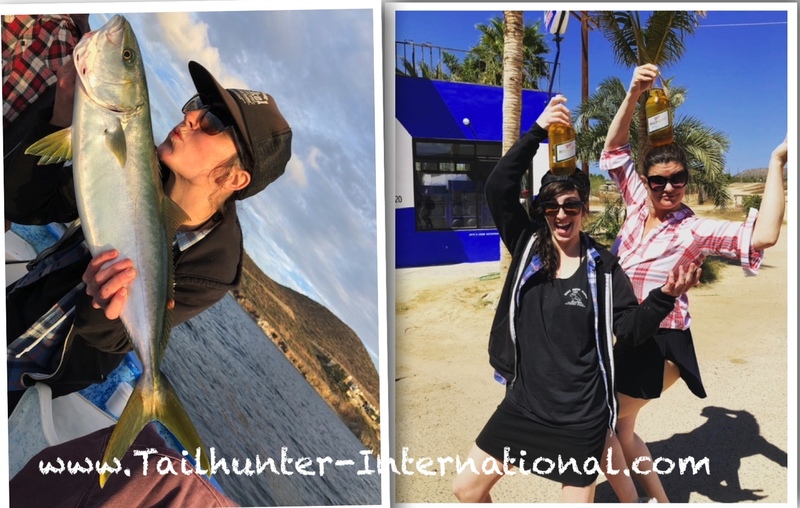 Catherine (“Kitty”) Beaton and her friend Kat Griffith…Kitty and Kat…are visiting artists visiting La Paz and gave fishing a try one day and got a nice little yellowtail and some bonito plus struck a pose with beers on their heads! Fun ladies! 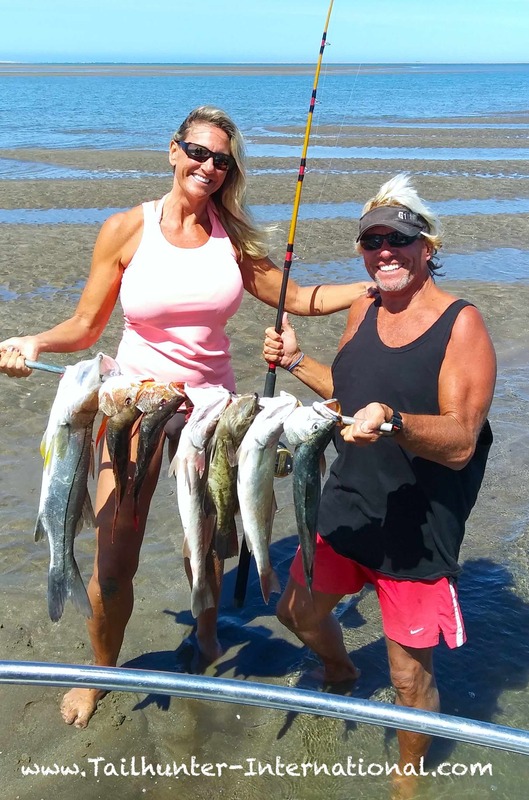 Amy and Rick Kasper from Wyoming show off just some of their catch from a day fishing with us at Bahia Magdalena at Lopez Mateos including snook, corbina, snapper and cabrilla. Rick is bent again! Not the shallow waters in the heavy brush of the bay. For the third week in a row, fishing took a hit from winter winds and strong currents. There were a few windows of fishing, but overall, it was picky at best. Most of the time, it was simply frustrating. This is the reason it’s called “off-season.” The weather is a major factor. It affects getting bait. It affect being able to fish. It affects where and how we fish. Honestly, some days, it was barely worth going out which is why we warn out anglers how it can be this time of year. We did get a few yellowtail. There were a few jags of bonito. Some cabrilla and snapper rounded things out, but that was kind of it. On the upside, the good thing is that we don’t have that many folks fishing this time of year. Our action on the Pacific side was a bit better. Winds didn’t affect thing at all in the protected waters. Fishing from Lopez Mateos, there was some excellent inshore action for snook, dog-tooth snapper, corvina and pargo using live shrimp. Also, we had some good days of whale watching with numerous whales spotted and approached. LOPEZ MATEOS WHALE WATCHING GOING WELL! 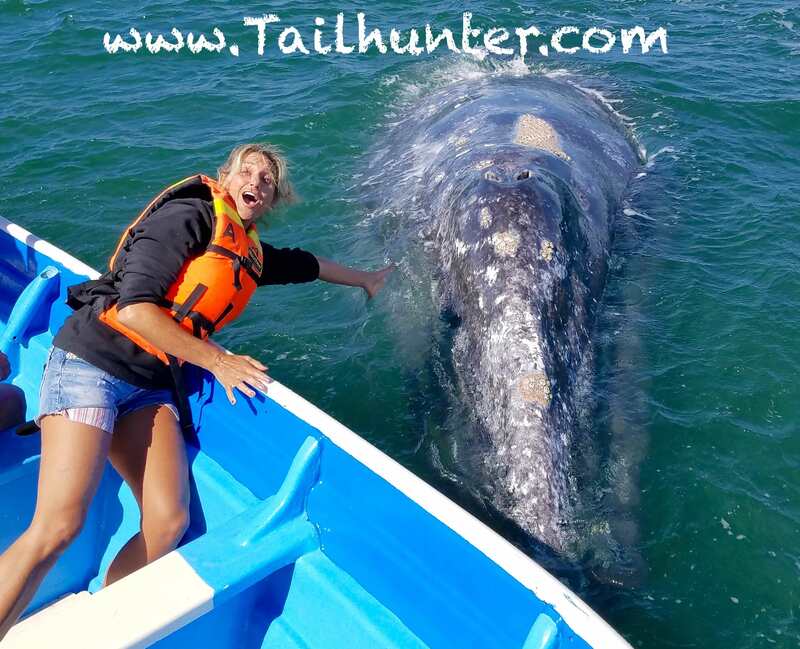 Our yearly whale-watching tours over to Lopez Mateos in Bahia Magdalena are still rolling super! 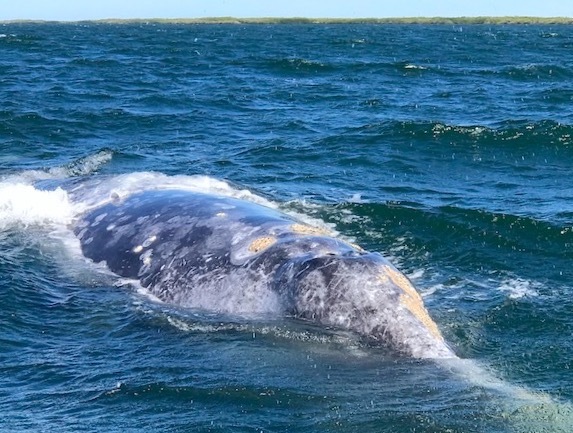 It appears the whales are sticking around a bit longer than normal. Usually by this time of year, the whales are starting to move out, but we’re still seeing numerous whales in the calm bay waters. Check out the photos and video below! It’s a great experience. We’re told the whales should be around for a few more weeks! Peek a boo! Coming up for a nose scratch! A curious female gives Amy a thrill! Turn up the sound on this video. That’s Jorge Romero’s voice! THANKS BOISE! THANKS LONG BEACH! HERE COMES LONG BEACH! Jill and I had great weeks! 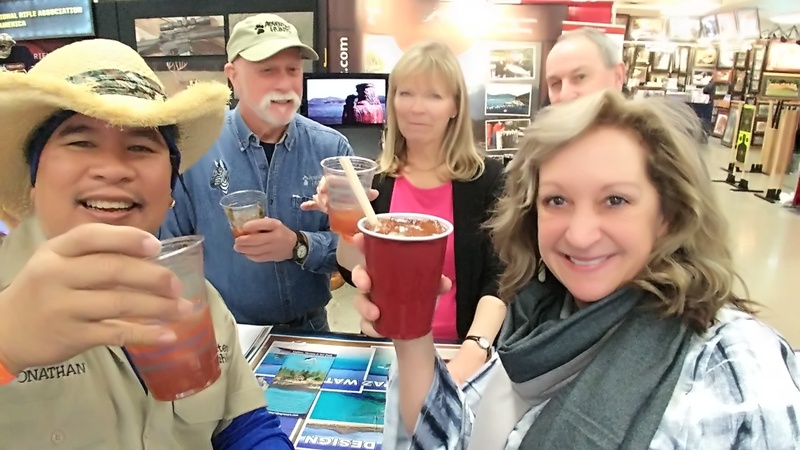 Jilly spent the week at the Idaho Sportsmans Show in Boise, Idaho. 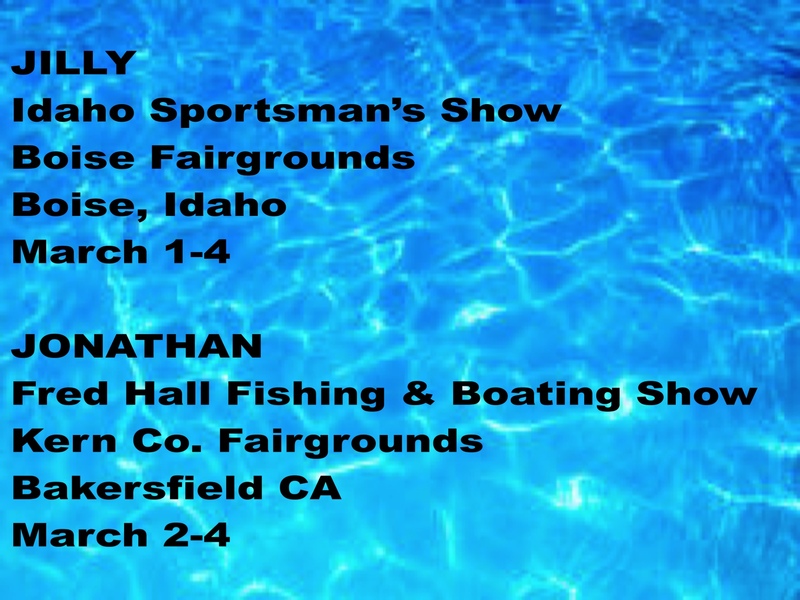 I was at the Kern Co. Fairgrounds at the Fred Hall Central Valley Outdoor Show in Bakersfield CA. Great to see so many of you and we’re looking forward to everyone who’s coming to visit us in La Paz in 2018. Now, we move onto the biggest and oldest show on the West Coast! 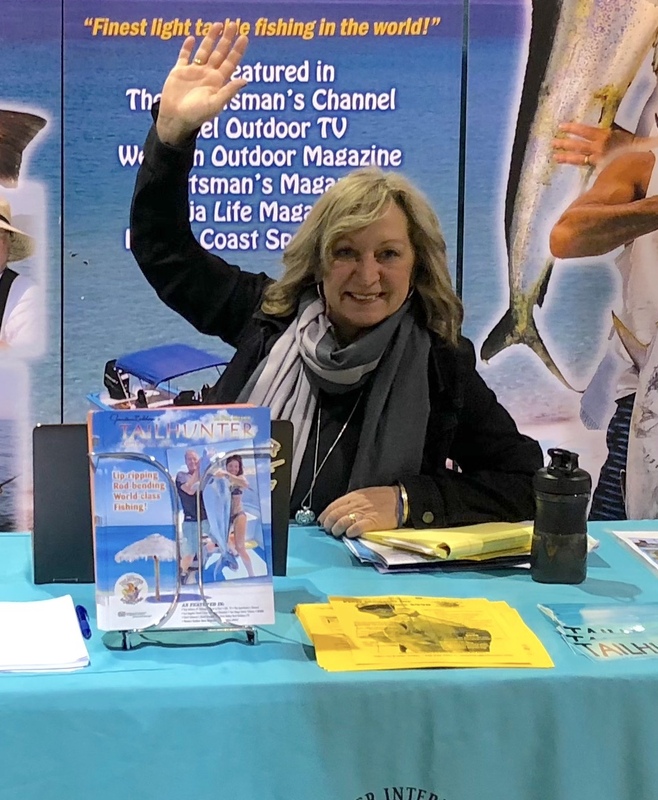 It’s the massive Fred Hall Fishing and Boating Show in Long Beach CA at the Long Beach Convention Center. The show runs Wednesday to Sunday and it’s a monster! Tons of stuff for fishermen, hunters, families, and the outdoors. Not to be missed! Hope to see you there. We’ve moved our booth too. 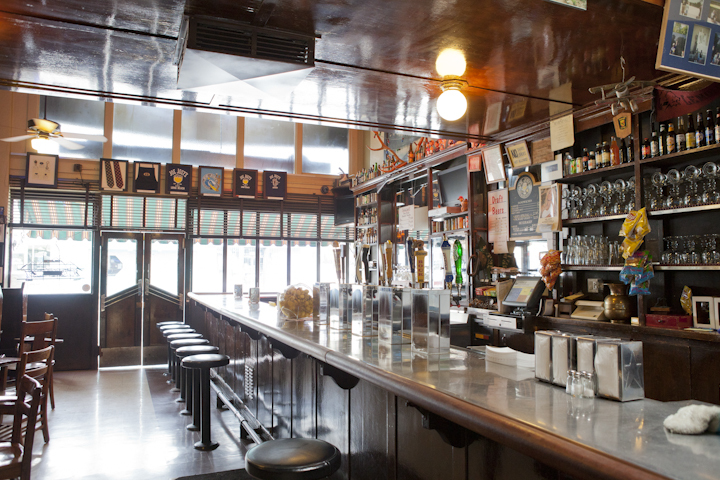 After 20 something years, we’re now one row over in a corner booth. More space to say hi to you! Tuesday is Jonathan’s birthday. 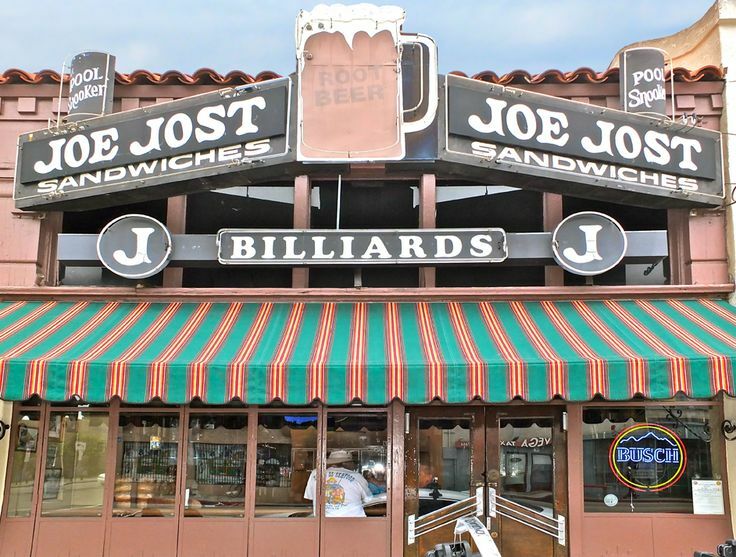 If you’re in the area about 5 p.m., we’ll be hanging out at famous legendary Joe Jost’s in Long Beach for beer, picked eggs, liverwurst (yes, they serve that! ), egg salad sandwiches and hot dogs (that’s all they serve!). Come join us! It’s located at 2803 East Anaheim Street, Long Beach CA. 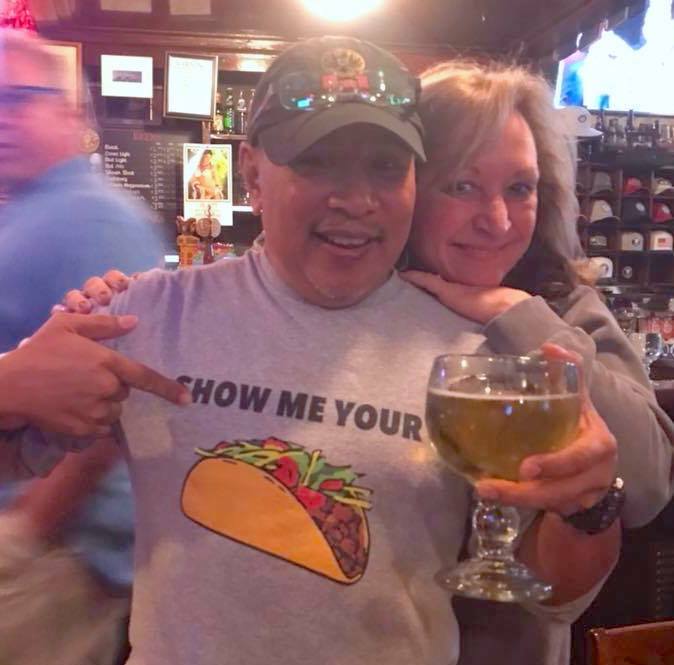 Not sure how long we’ll stay since alot of us have to be at the Long Beach Convention Center the next day for the Fred Hall Show, but at least long enough to have a few cold ones. TAKE UBER! To be honest, not much to show you this week. Winds and strong current made it tough…as often happens during the off-season in winter and we even had to cancel trips later in the week. We only got some smaller reef fish like these that included pargo, snapper and cabrilla. Good eating, but not our best..but not much to do about the weather. It is what it is. Prime time for our whale-watching tours right now, but weather this week forced cancelations and postponements. When there’s storms in the U.S., it usually affects us as well down in Baja. This coming week looks much better! Not much to tell you this week. Early in the week we had a few people, but the fishing was hampered by strong winds and currents so we had to stay close which resulted in a few small reefish like pargo and cabrilla. As the week went on, winds got stronger. We didn’t have many reservations, but the few we had postponed trips until the winds died down. Fortunately, they were in town for a few days and had flexible schedules. 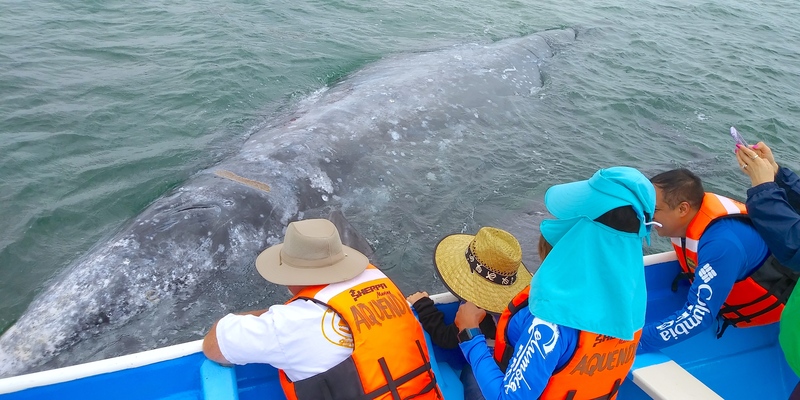 We even had to cancel some of our whale watching trips to Bahia Magdalena because of winds and some spats of rain. It’s like this in winter. If there’s storms in the U.S. there’s usually an effect in Baja and the western U.S. got a lot of cold, wind, rain and snow this past week. The coming week should be better! Well…we’ve been on the road now almost 2 months with 6 more shows to go! Coming up, Jilly and I head in two different directions again. Two great shows that we just can’t miss so. These are just way too fun with lots for the whole family and we have lot of friends and amigos there! Come say hi! 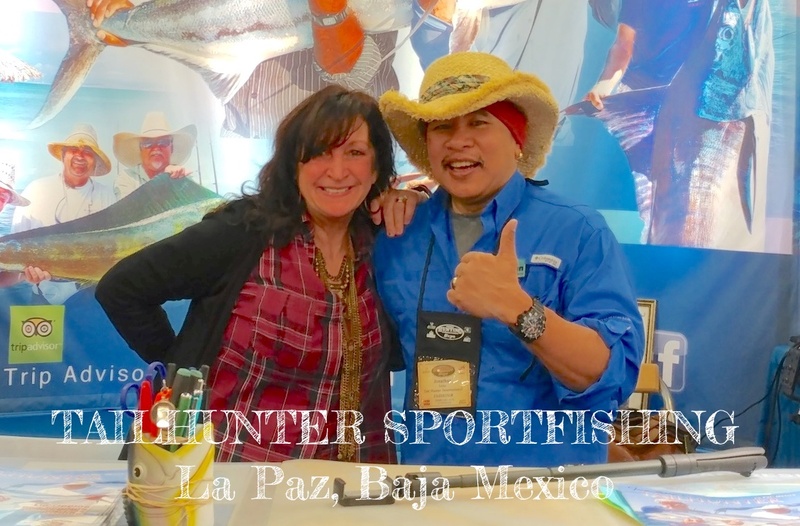 Let’s talk about fishing in La Paz this year . 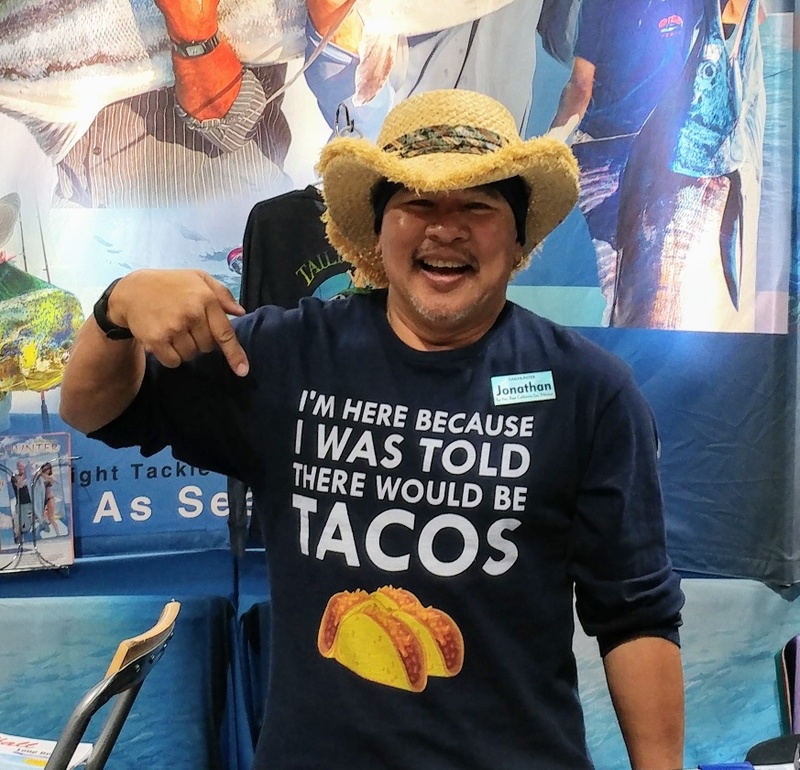 Check out our new t-shirts and pick up a copy of our new 24-page Tailhunter brochure for 2018. Lots of super things to see and do for the whole family! See you there! 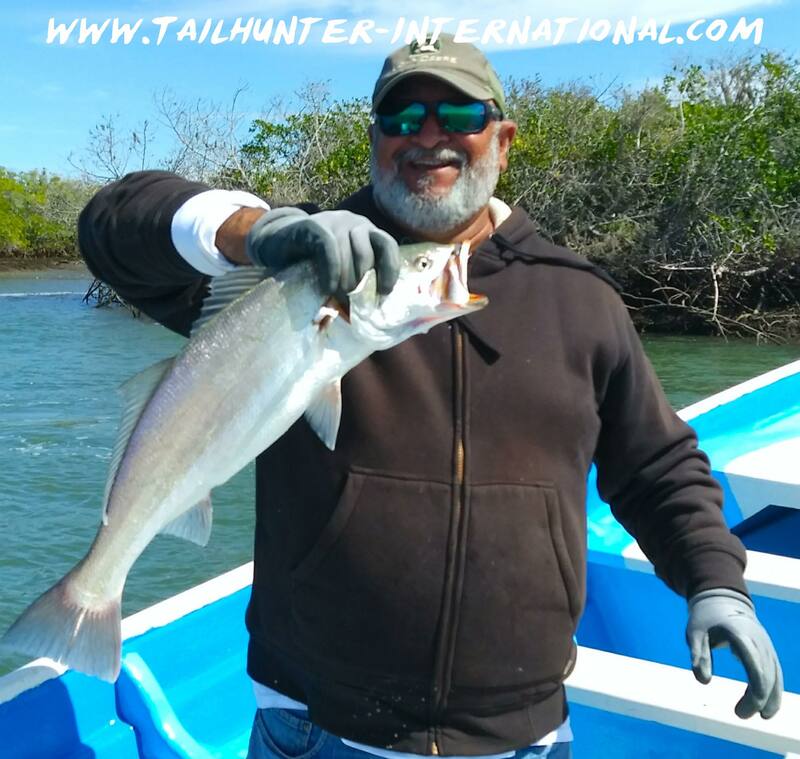 Captain Adolfo of our Tailhunter Fleet at Las Arenas took Dr. 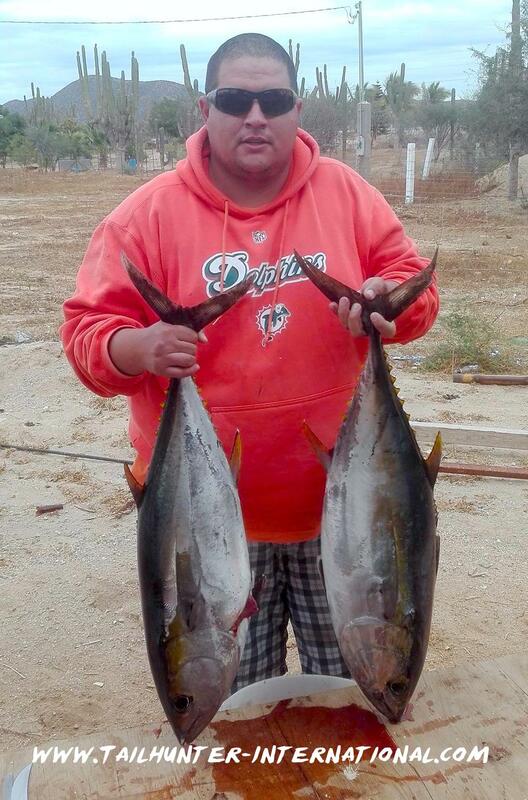 Guy Nazareno from Fremont CA out and plugged the box with some nice fat yellowfin tuna. 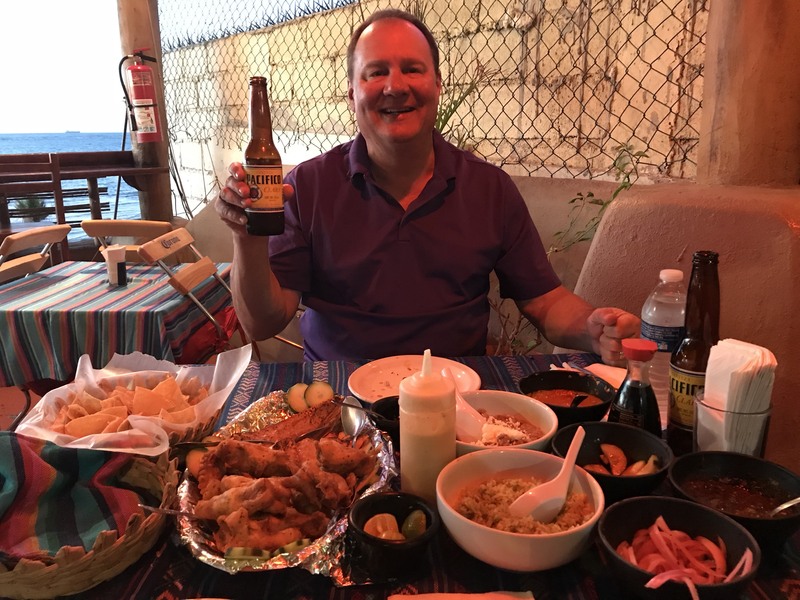 This was Guy’s first visit to fish with us in La Paz. 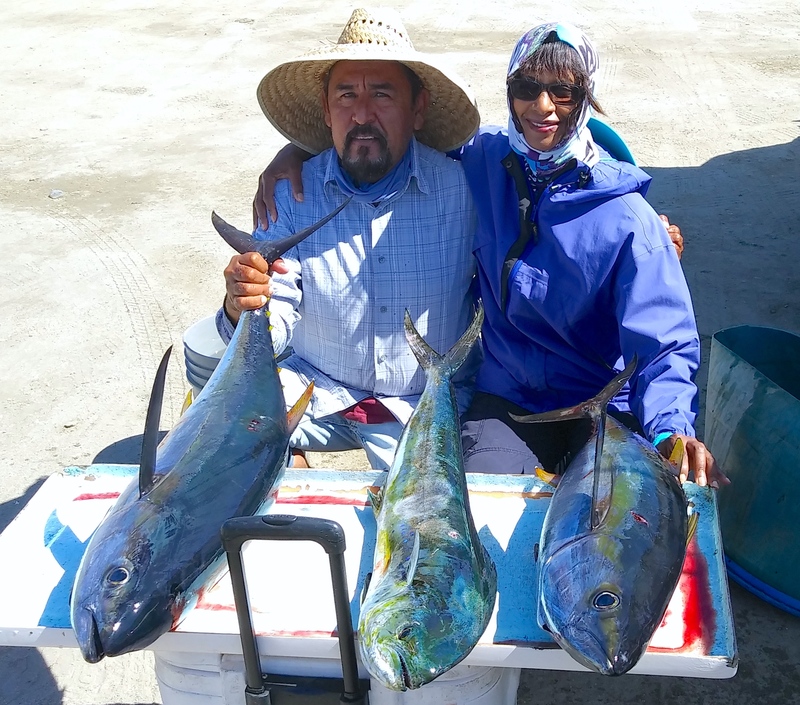 Our good amiga, Verda Boyd, with her favorite Captain Jorge comes to see us once or twice a year and she started her week off with some sturdy yellowfin and a legit dorado from Muertos Bay. 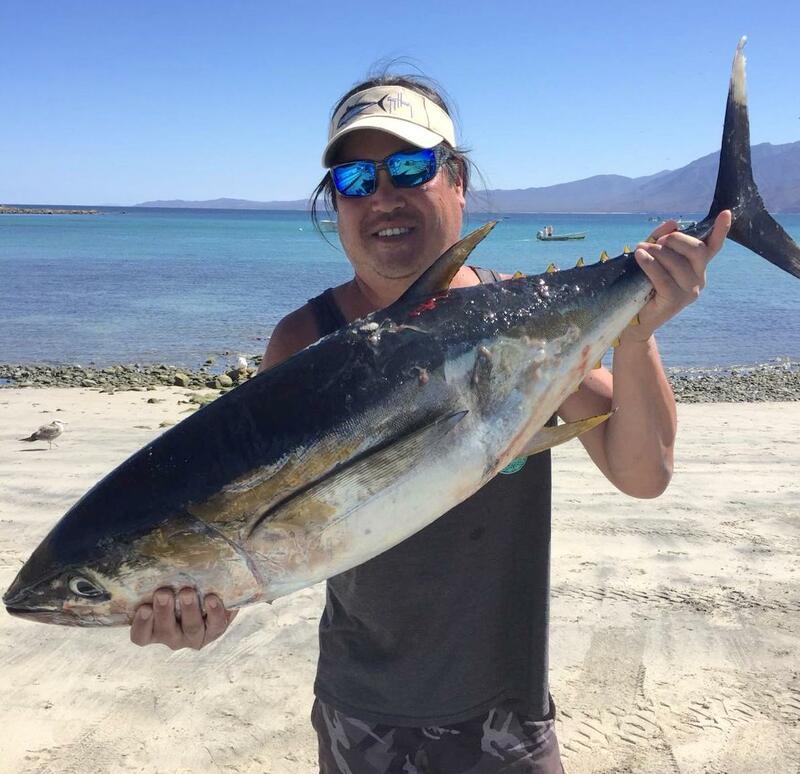 Two more yellowfin tuna for Alex Dominguez using live bait at the south end of Cerralvo Island. Our own popular head of Tailhunter’s transportation, Jorge Romero poses with another of our great amigos, Tim Zimmer, and another yellowfin tuna. 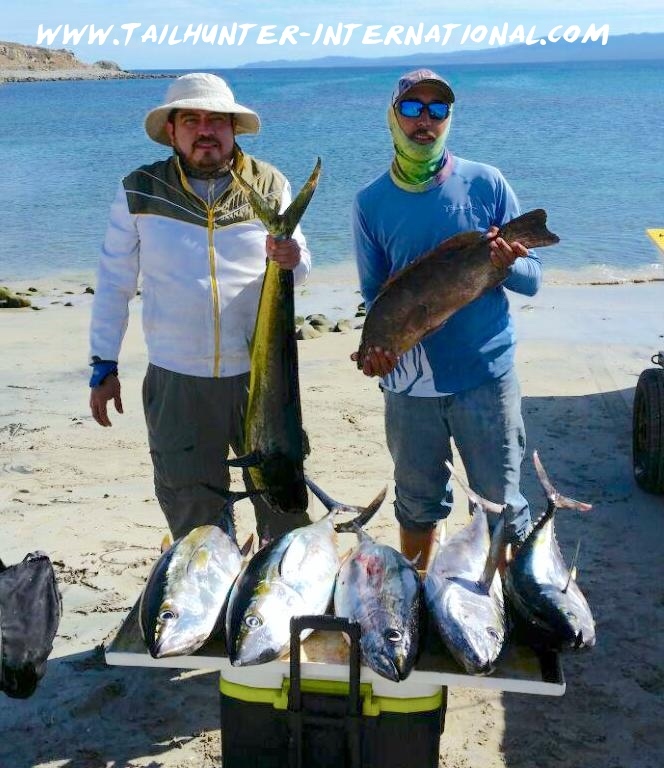 Again, we had some atypical fishing for winter in La Paz. 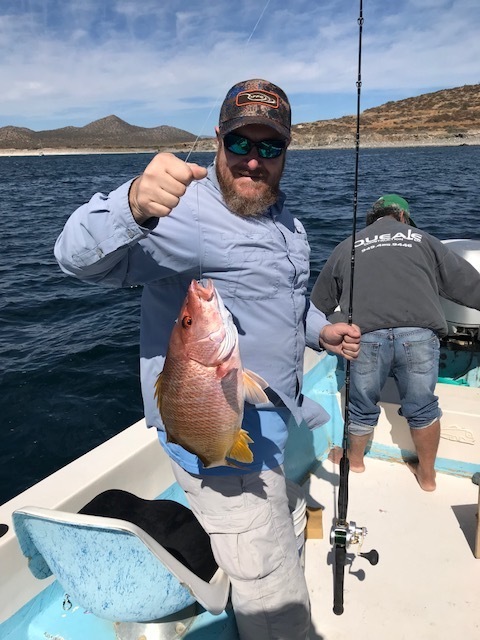 As usual, there were some days when the winds were blustering and the currents were strong so we ended up fishing around the rocks and reefs of Bahia de los Muertos to keep in the protected waters. Fishing produced jack crevalle, sierra, bonito, snapper, cabrilla and cargo. Or, towards the end of the week when winds pretty much completely hindered any effective fishing. However, once again, we were surprised by the showing of yellowfin tuna which we don’t usually see so early in the year, especially during the winter months. Using live sardines or frozen squid, fish were running healthy 15-40 pounds. Fishing was best when the winds and current were diminished which allowed us to get to the live bait spots and then make the short run to the south end of Cerralvo Island. Earlier in the week when waters were calmer, we were getting 1-6 tuna per panga. 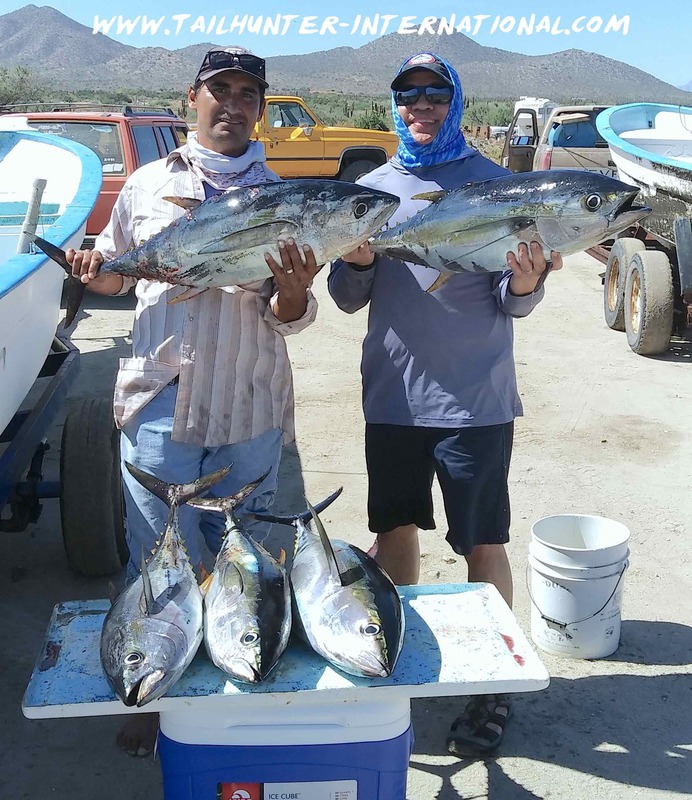 Later in the week as waters got a little more choppy, fewer but larger fish moved in with schools of bonito limiting the tuna bite although the few fish we got were generally larger than the earlier fish. The same area also produced a few dorado as well. Our whale watching season is in full-swing right now and we’re running daily and overnight trips to the whales. Check out some of the photos and video from this week! Popping up to visit! A grey whale spy hops between two pangas! Well, hello, Mama!! Come to play! Turn up the sound. Some funny stuff to listen to! The Dworaks on their panga among the dunes of Mag Bay. 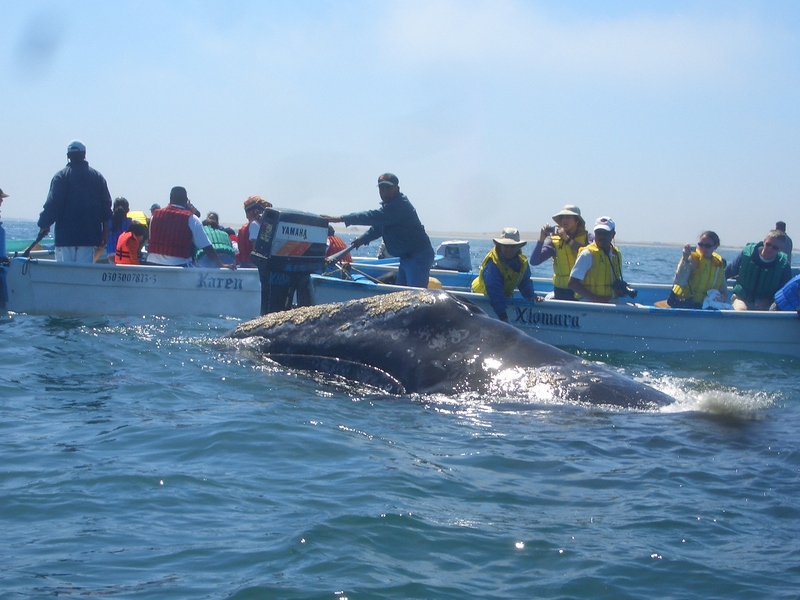 MAGDALENA BAY EXPLORATORY TRIP ROCKS! 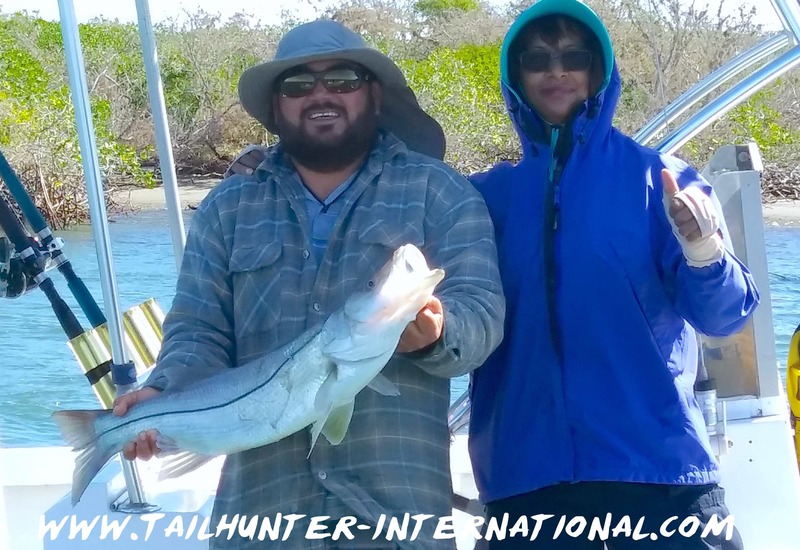 Saul Ochoa poses with Verda Boyd who was on fire in the shallow backwaters of Bahia Magdalena hooking another tasty snook! 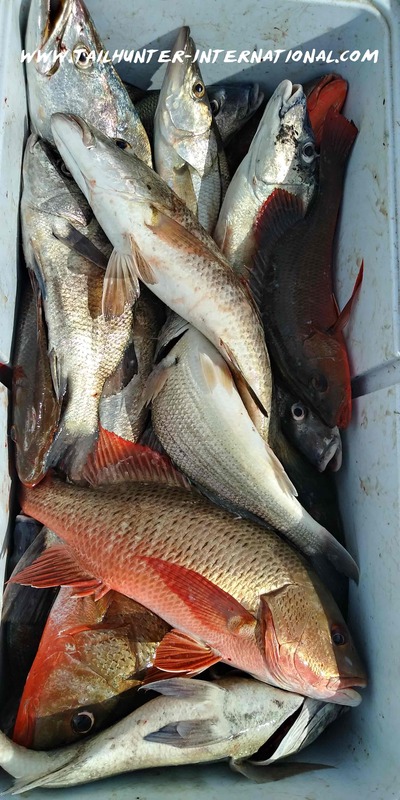 The variety of fish was outstanding on the light tackle including pargo mulatto, dog tooth snapper, red snapaper, snook, corbina, black snapper and snook. Happy guy, Jorge Romero, with a nice white corvina he said tasted great with salsa vera cruz back in La Paz! 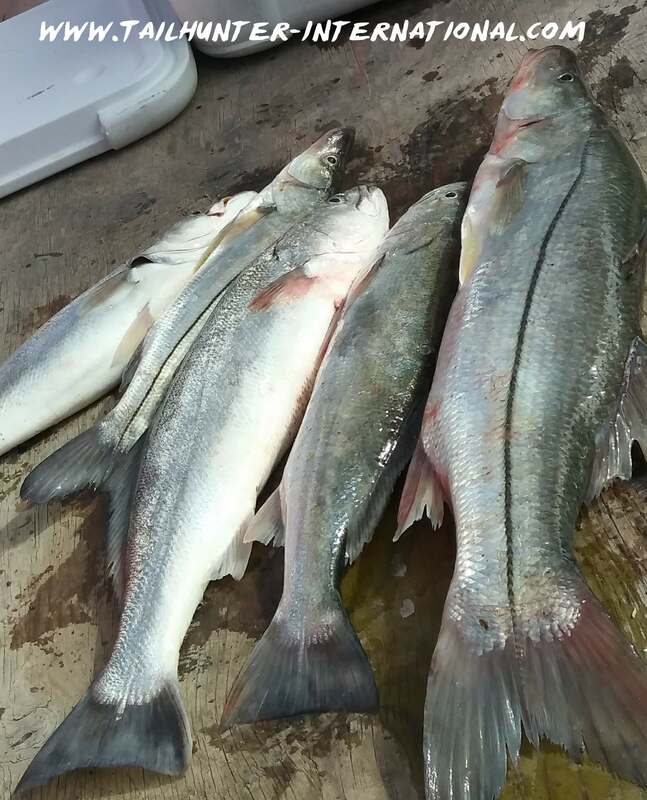 Snook and corbina on the deck were some of the surprising catches! 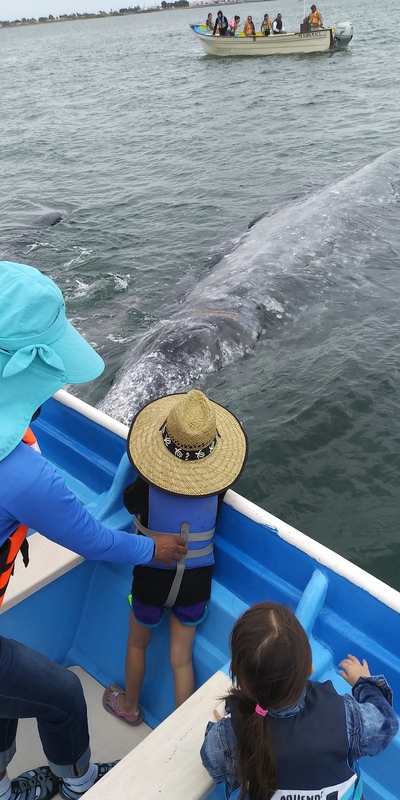 For the first time, we sent out some exploratory trips to check out the inshore fishing at Bahia Magdalena about 3 hours from La Paz in the hundreds of square miles of calm shallow lagoon waters. We are ecstatic about what we encountered using live bait and light tackle. 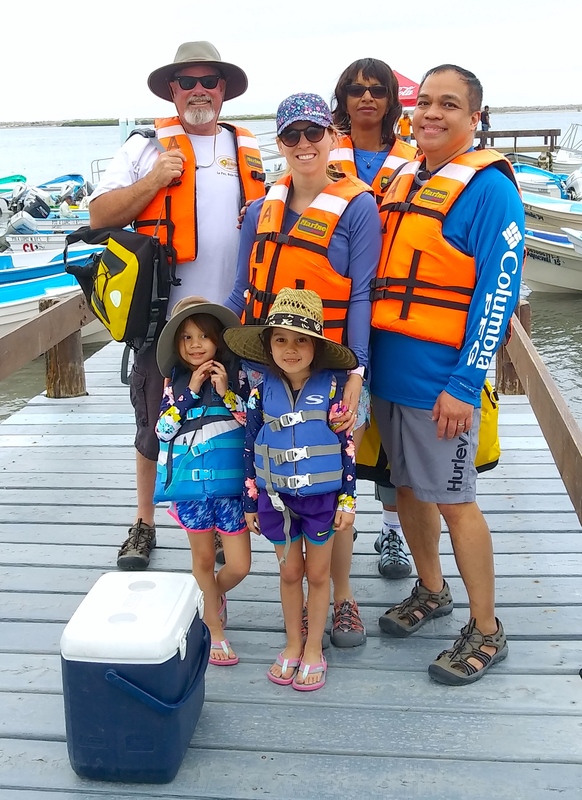 Fishing in the brush and mangroves of the brackish water, they encountered numerous species including snook, dog-tooth snapper, yellow snapper, big white corvina, black snapper, cabrilla and many others! We plan to send out a few more exploratory trips and may start running panga fishing there before the season is over. ADIOS LA PAZ CARNAVALE 2018! 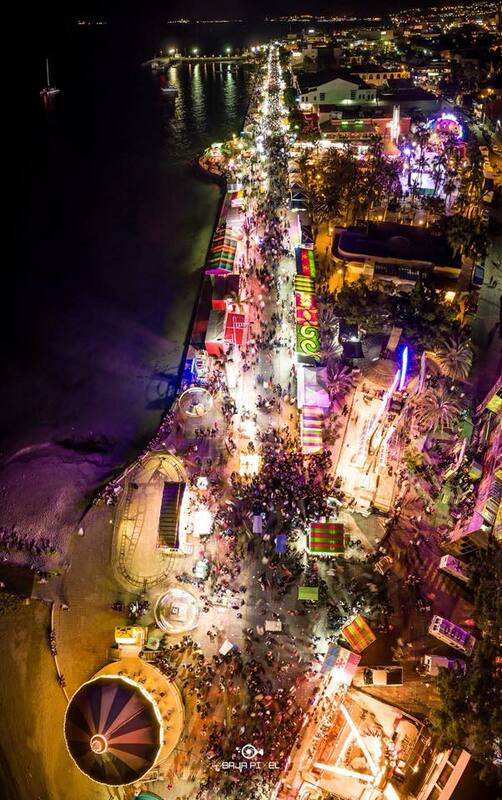 For almost a week, La Paz rocked with the sounds of the biggest street fair of the year as the entire waterfront Malecon of the city held it’s traditional Carnavale with rides, parades, food, incredible music and all kinds of crazy fun. Thanks to everyone who filled our Tailhunter Restaurant which is right on the waterfront to spend their Carnavale hours watching all the parades! Viva La Paz! Great aireal view of the waterfront! Tailhunter is at the very top of the photo somewhere in the lights and revelry of the 6-day event! The pandemonium in front of our Tailhunter Restaurant for one of the night-time parades! 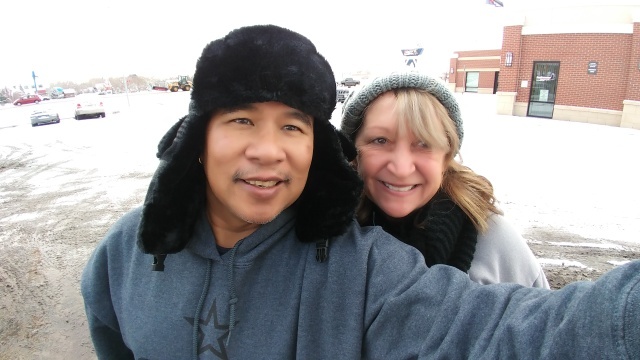 On the road can be a little chilly sometimes! Much warmer in the booth! 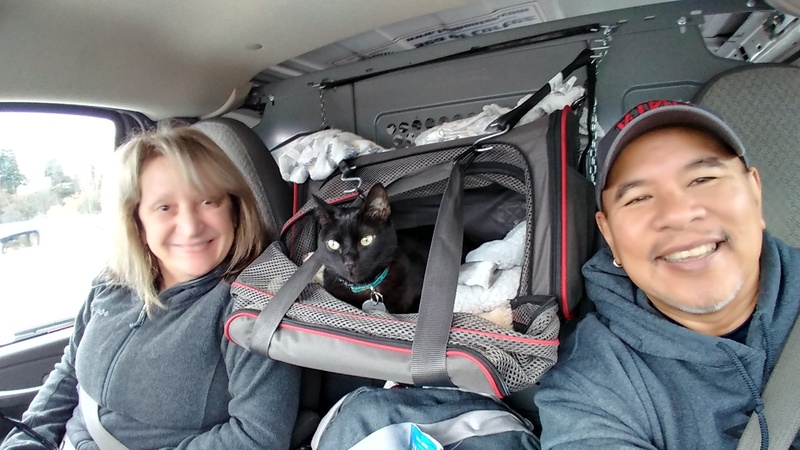 Jilly and I have been on the road now since the end of December! 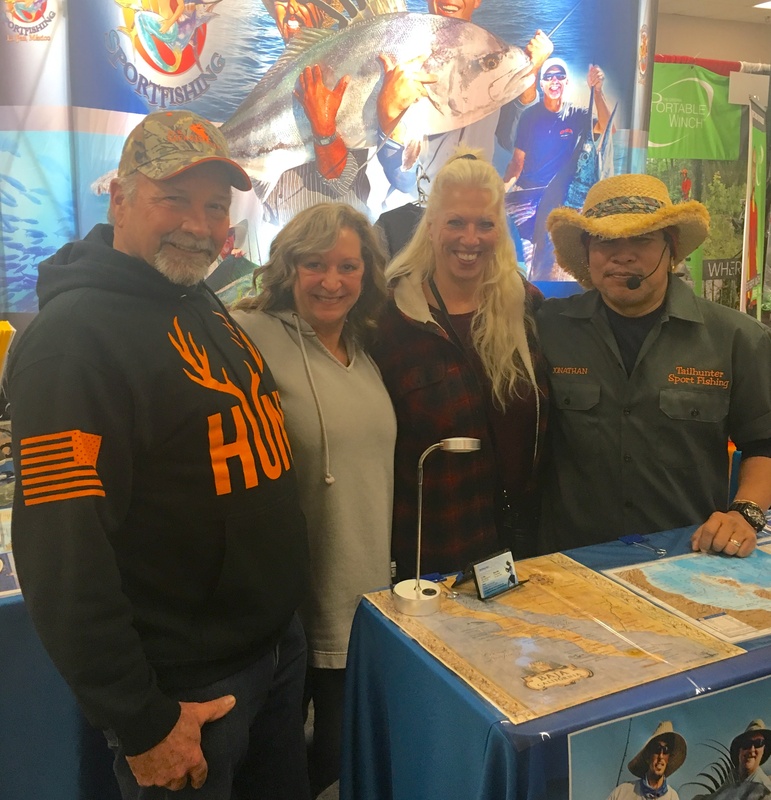 Thanks to everyone for all the hospitality we’ve rec’d at all the great hunting and fishing shows we’ve attended including, Denver, Sacramento, Seattle/ Puyallup, Portland and Salt Lake City. So great to see so many of you and thanks to everyone for visiting and a special shout-out to everyone who has booked to come see us in La Paz this year! We’ve surely had an incredible time at the shows and as we’ve criss-crossed the western United States! If you’re interested in coming to see us, let us know! Dates are filling fast. Call us at 626-638-3383 or, for faster responses from the road, e-mail me at: Jonathan@tailhunter.com. We’ll get right back to you. We still have 6 more shows to go: Bakersfield, Boise, Long Beach, Salt Lake City (again), San Diego and Scottsdale/ Phoenix. Here’s our next set on the agenda! Hope to see you there! That’s our story! Have a great week! 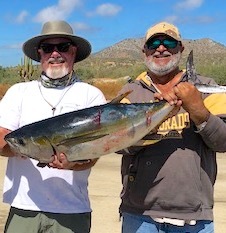 Rick Kasper from Wyoming has a big grin with his tuna and dorado and says they also caught cabrilla, dozens of bonito and lost a bigger dorado! 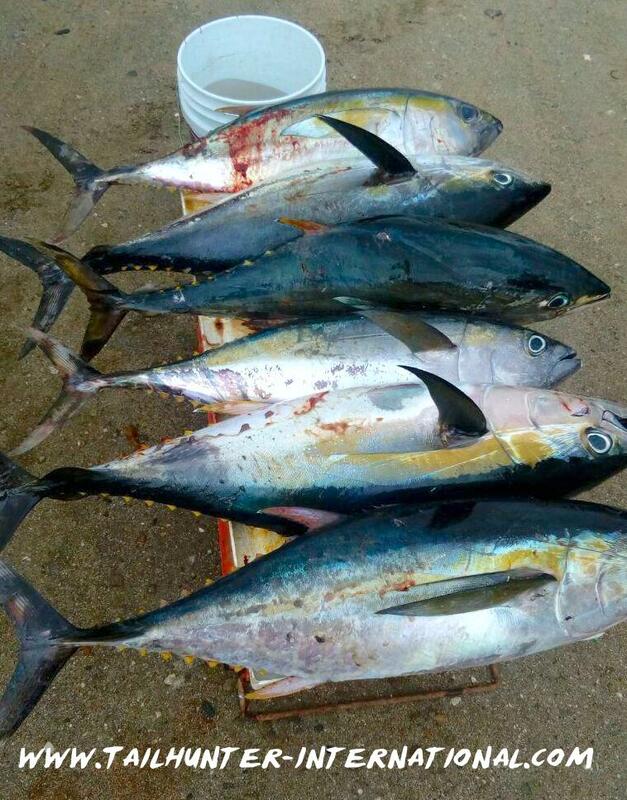 Captain Armando got the guys onto the tuna spot returning with a nice batch of YFTs! 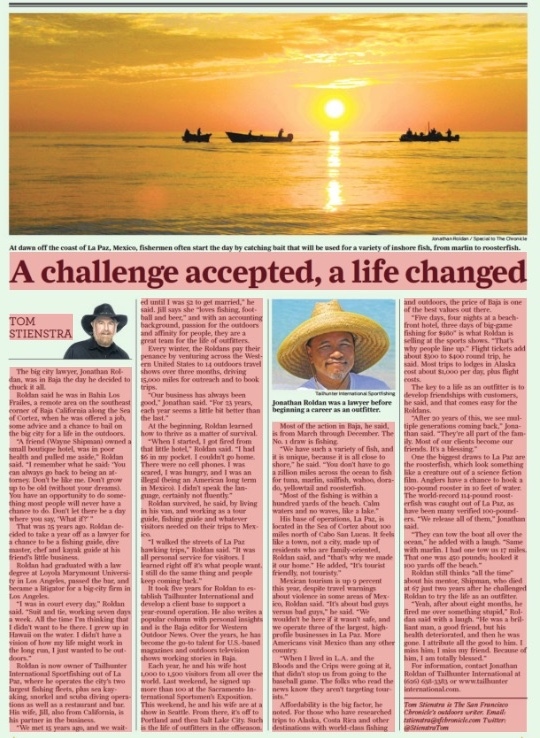 Dr. Doug Finn from New York likes spending a few weeks every winter in La Paz and getting in some fishing. He shows off one of his yellowfin tuna on the beach at Muertos Bay. Our fishing report this week is almost identical to last week. Not many folks fishing this time of year. Typical windy days and then great sunny days and the key is really figuring out which days will be windy or not. On the days it’s windy there’s two choices. 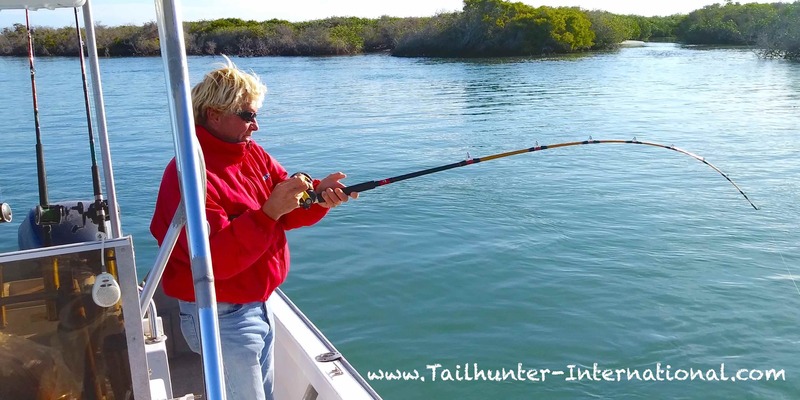 Either stay ashore and figure a different day to fish or go out and fish inshore where we’re catching the usual structure fish like pargo, cabrilla or snapper. Just a little outside, bonito, sierra and jack crevalle add to the catch. Maybe the occasional dorado. However, on the calmer days when we can move off just a bit further, especially over to Cerralvo Island, there’s yellowtail, big dog tooth snapper and the SURPRISE!!!! ….some decent 15-30 pound yellowfin tuna. Slow trolling deep running Rapalas, live sardines and chunked frozen squid have been working best. Normally, we don’t see these tuna out here this time of year. The tuna are usually a spring / fall fish for us, but this is a real nice bonus. There’s a spot of tuna off the south end of Cerralvo Island holding the fish but it’s all dependent on being able to make that quick run over if the wind and waves allow. Fortunately, this past week there were some good days to make the run because if it’s blowing, it’s also hard to get the bait! This would be nice if it holds out. I’m not sure if these are left-over fish from last season or we’re onto the beginning of a super new season! Will keep you posted for sure! Pretty cool stuff! THANKS PORTLAND! GRACIAS SALT LAKE CITY! 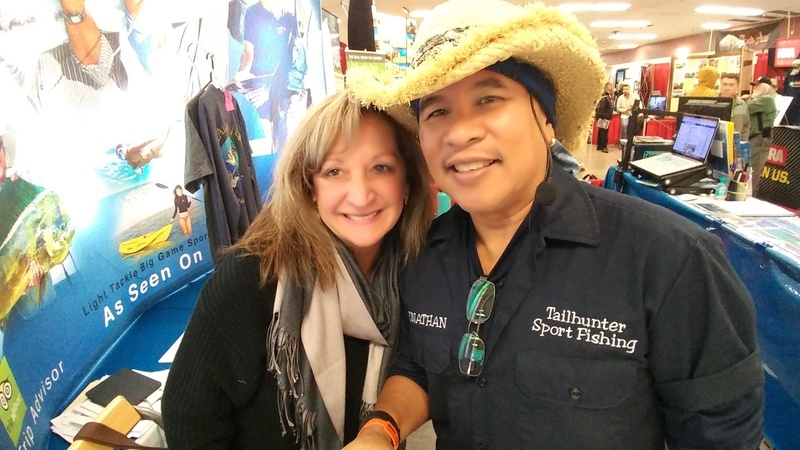 Our 2018 Tailhunter Road Tour has Jilly and I splitting up and headed in different directions this past week. 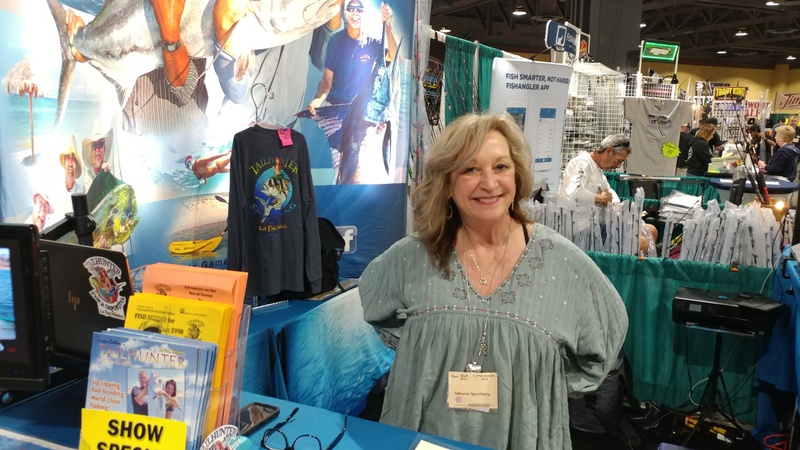 Jilly covered the super Great Western Hunting and Conservation Show in Salt Lake City, UT. I held the fort in our booth at the Pacific Northwest Sportsmans Show in Portland, Oregon! Wow…what killer fun shows! Thank you everyone who came to visit! When we’re alone it sometimes makes it hard to chat as much as we’d like to, but we sure appreciated seeing you and big thanks also to all of you who booked trips with us this year! We’re looking forward to the visit. We’ll have some fun! Next, we split up again . 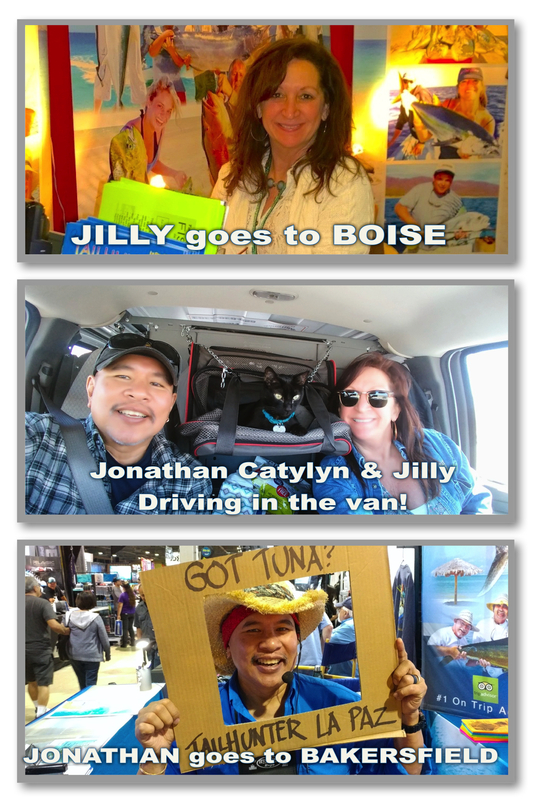 I’ll be in Bakersfield and Jilly head to Boise Idaho. Come visit and we hope to see you there! 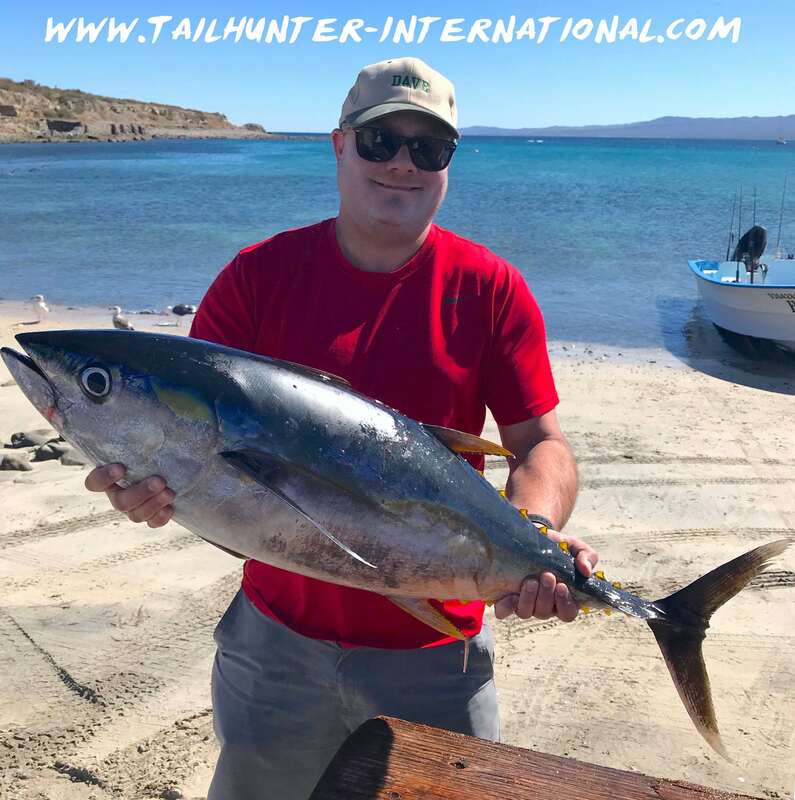 Aaron Garcia got out on one of the flatter days over to the south end of Cerralvo Island and found a nice spot of yellowfin tuna willing to eat live and dead sardines. 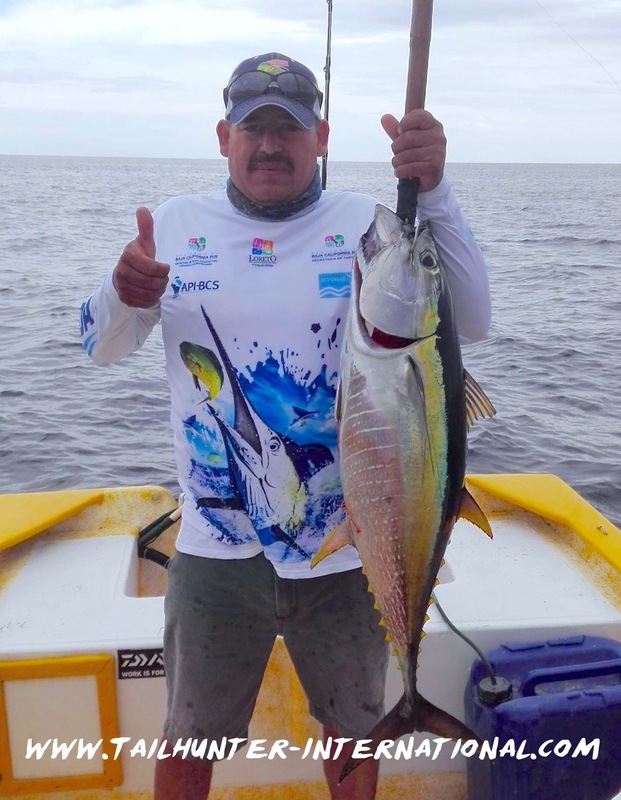 Captain Pancho was out with Dr. Santiago Morales and found quite a mix including some chunky tuna, a dorado and a cabrilla! Nice 15-25 pound rack of yellowfin that showed up at the sound end of Cerralvo Island mid-week. Very unusual to be seeing these tuna this early in the year, perhaps holdover fish from last season’s great tuna bite. MIke Distel and son Dave Distel with a couple of great eating cabrilla caught over the rocks. 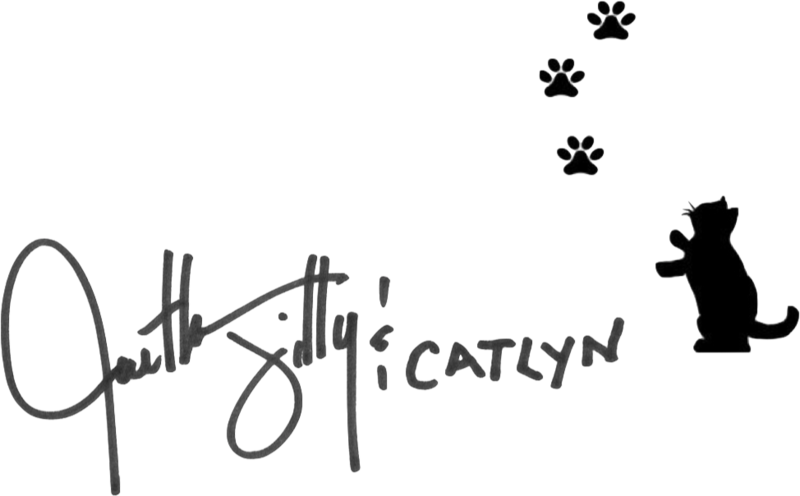 Jilly will be in Salt Lake City UT this week at the Great Western Hunt and Conservation Expo at the Salt Palace. 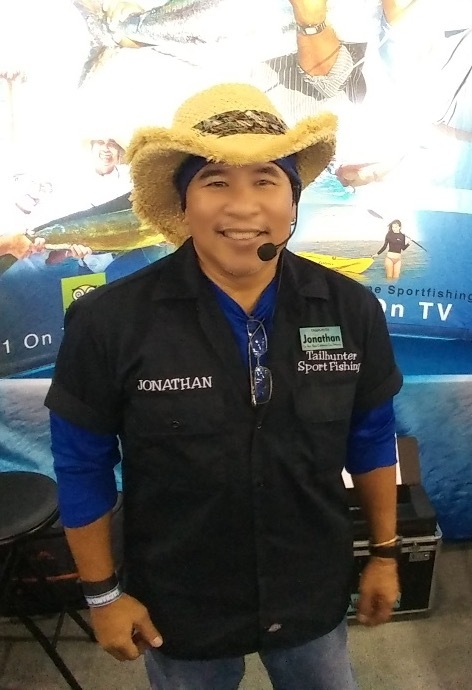 Jonathan will man the other booth in Portland Oregon at the Pacific NW Sportsmans Show! Scroll down for more details! Come say hi! It was a week of contrasts. But it’s often like that for wintertime fishing. Some days cloudy (and even a bit of rain this week). Other days were somewhat sunny. There were some expected windy days when we had to fish close inshore. When the winds weren’t blowing, we got out a bit further and our area of fishing was expanded. Not many folks fishing. On those days inshore, we got the usual. Not bad fishing. There were cabrilla, snapper, jack crevalle, bonito and sierra as well as some pargo. Bonus fish, some dorado as well schooling around the shallow waters. 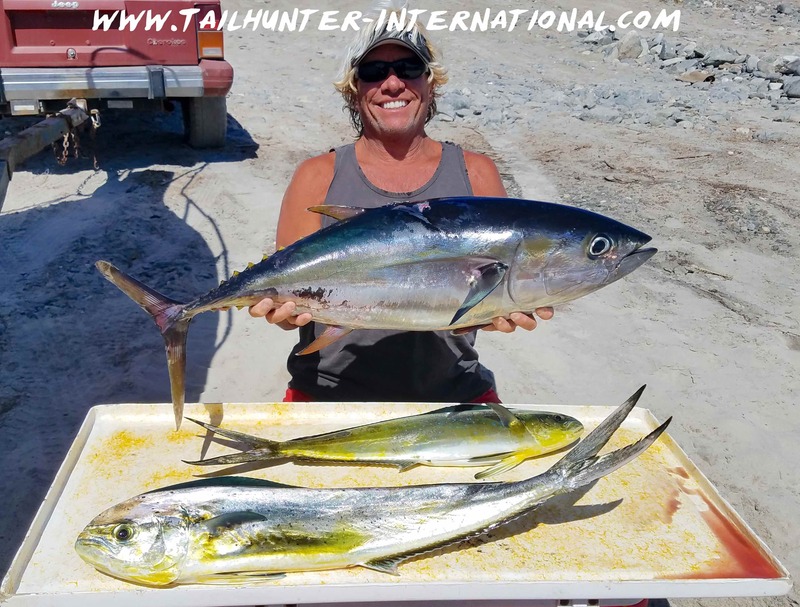 On the few days we got over to the island there was a spot of decent yellowfin tuna that were eating sardines that we were also able to find over by the island. That spot was just on the high spot right off the rocks. It’s pretty unusual to get tuna this time of year, but these 15-25 pound fish were ready to chew. Simply flylining the sardines without weight and letting them sink and drift got the fish to bite. HELLO PORTLAND…AND SALT LAKE CITY! In the van with Jilly and Catlyn hanging out and no the road! Only 2 more months and 8 more shows to go! We love it! Goofing with Jilly in the booth! We are back on the road again and after spectacular shows at Denver, Sacramento and the Washington State Fairgrounds near Seattle, we’re back on the road and…SPLITTING UP! Nice plug yellowfin tuna for Dave Distel of Arizona. Pretty unusual to get a bonus fish like this in the winter! 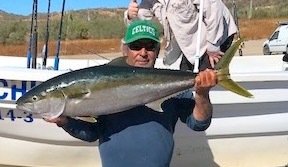 Dave Distel again with one of the firecracker yellowtail that’s come up close to shore. That’s Captain Victor grinning in the background. 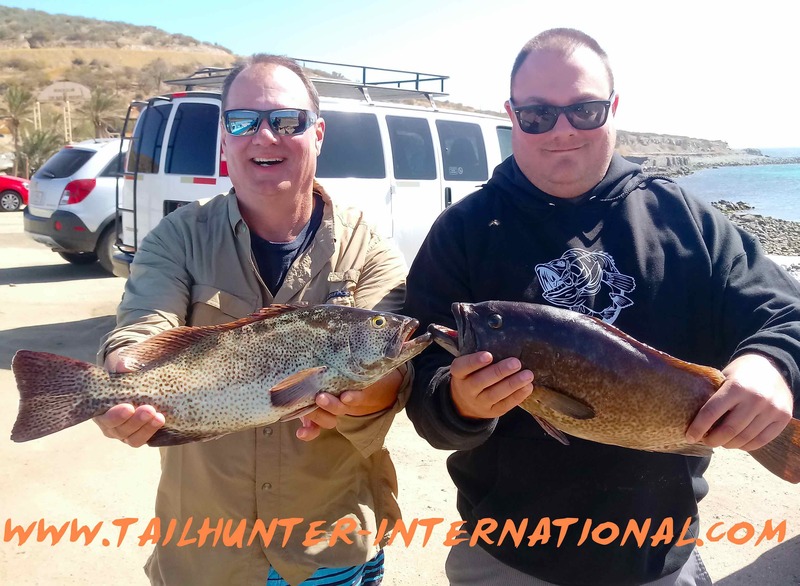 Happy Birthday to Mike Distel of Huntington Beach CA celebrating at our Tailhunter Restaurant with fresh cooked fish that he and his son caught! Still not too many folks fishing. It’s been pretty windy from the north as is pretty typical for this time of year and it’s the January slump when there’s just not that many folks in town either! It’s actually a nice time to be in La Paz. It’s sunny and relatively warm for the snow birds with day time temps in the high 70’s compared to where they’re escaping from. It’s just not necessarily the best time to be in the water. However, we did get some folks out for a few days for some scratchy mixed bag fishing. Again ,the winds weren’t exactly our friends. However… Inshore, there’s snapper, bonito, pargo, seabass and good schools of jack crevalle. There should be more sierra around, but it hasn’t been consistent. One day, they swarm and the next day, they can’t be found. 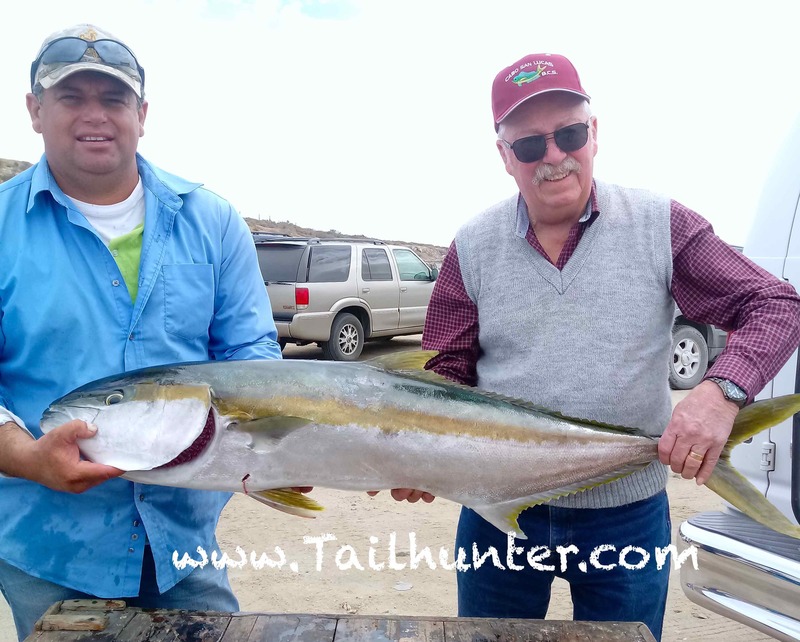 The more quality fishing has been some firecracker 10 pound yellowtail around and also some surprising 20-pound class tuna in Muertos Bay. Maybe still hanging out from last fall! One of our captains saw some free swimming wahoo as well, but they moved off. 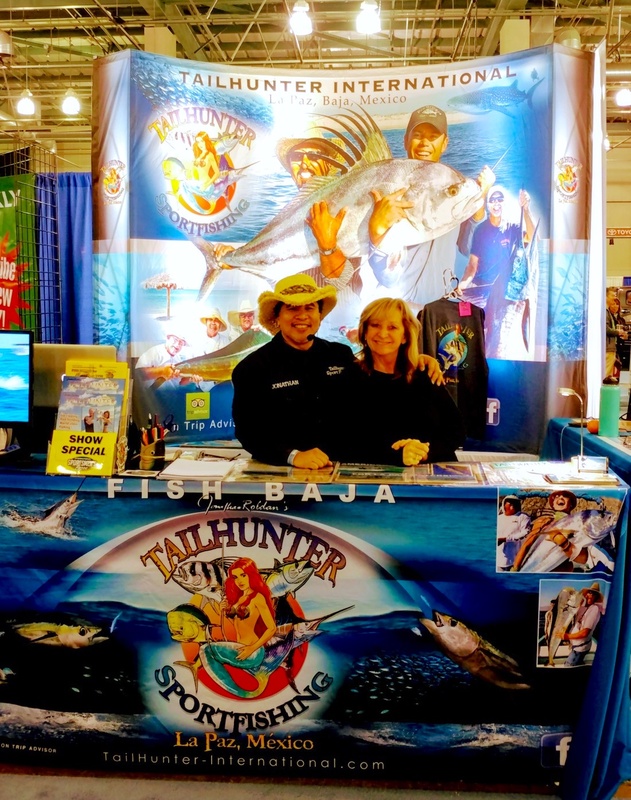 SAN FRANCISCO CHRONICLE – Highlights Tailhunter Sportfishing! Award-winning write Tom Steinstra of the San Francisco Chronicle wrote a feature article in the Sunday Edition of the Outdoor Section. Check it out! Click the link below to see the article! 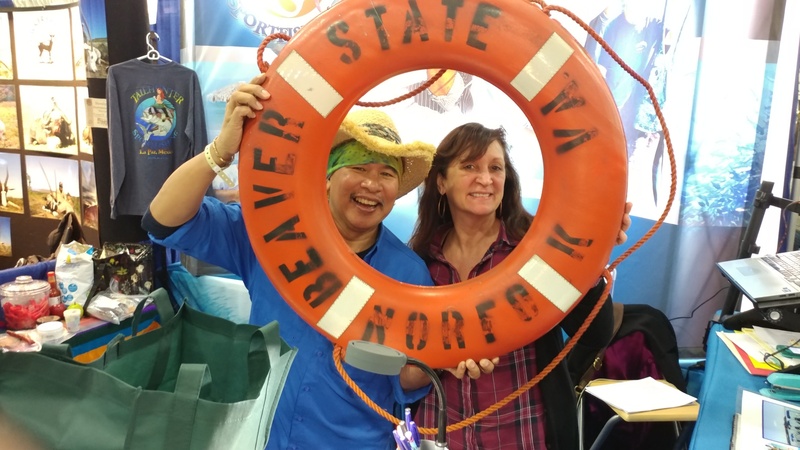 We had a way fun time and a great show for the five days of at the Washington State Fairgrounds in Puyallup just south of Seattle! 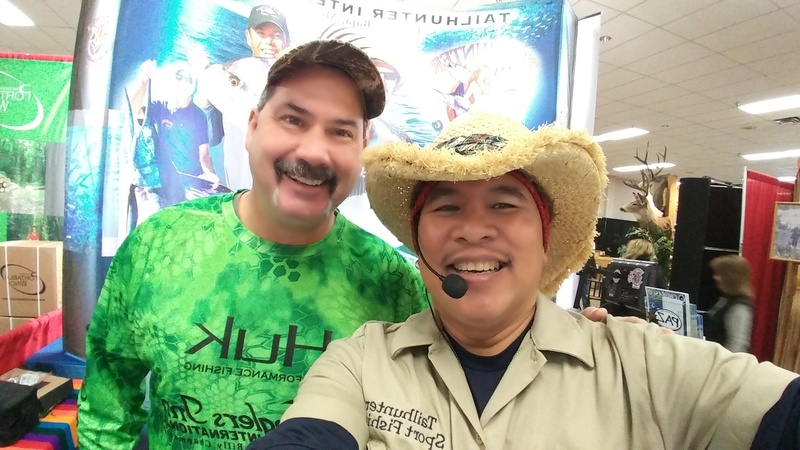 The Washington Sportsmans Show was super as always! 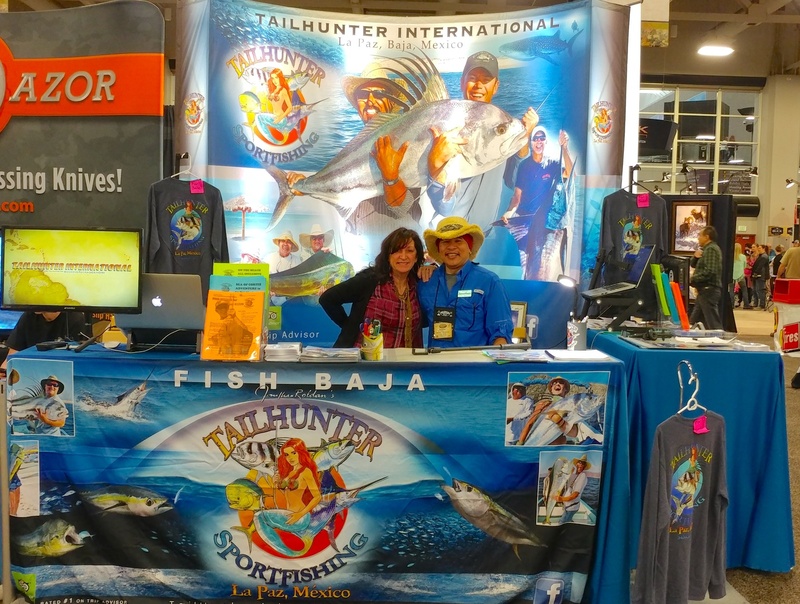 Great to see so many friends and Tailhunter Tribe members and also we’re looking forward to visits from everyone who booked trips to come see us and fish in La Paz in 2018. Thanks for all the hospitality, Washington…and the rain too! It just would’t be Washington without the rain! We love it! We live in a desert in Baja so it’s nice to see so much green! In two weeks, I will man the booth at the Northwest Sportsmans Show in Portland, Oregon at the Expo Center right next to the Columbia River. Jill will fly out to the huge Western Hunt Expo at the Salt Palace in Salt Lake City! I’ll post up more details next week. We’re looking forward to seeing all our amigos! Jilly and I working the booth at the Washington State Fairgrounds! Good buddy and pro-fisherman Mike Whitlow from Washington who sets up trips for awesome bass fishing in Mexico at El Salto Lake and also in Brazil for big peacock bass. A rough crowd of ne’er-do-wells! Ken and Lisa Chapman who book big game hunting in South Africa join Jilly and I in the booth! 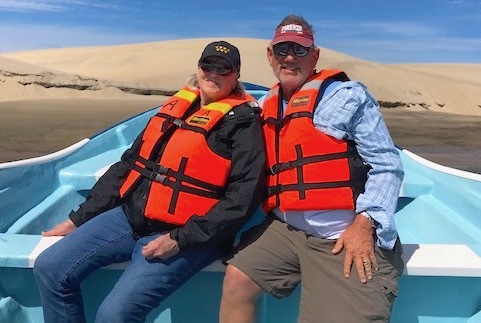 Dave and Michele Conklin have visited us many times in La Paz! Good to see them on their homegrounds in Washington!